It is also the season of turkey. For some, cooking a turkey is a breeze and those lucky family members are treated to a golden-brown, juicy and flavorful bird at their yearly feast. To those accomplished cooks, I salute you. For others, dragging home a whole frozen animal, defrosting it for days and attempting to produce a meal that isn't dry (or worse, still a bit raw!) is quite the challenge. Those home cooks on the latter end of the scale may recall the turkey pop-up timer. This is an ingenious little device that comes standard in most turkeys and tells you when the bird is cooked thoroughly. Typically white with a red stick, this timer has a soft metal or wax at the bottom that traps the red piece in place. 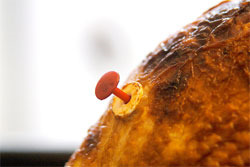 When the bird reaches 185 degrees Fahrenheit (the ideal temperature for a fully cooked bird), the metal melts and releases the helpful red stick. You are probably asking yourself where I am going with this, besides succeeding in making us all hungry. Believe it or not, there are similarities between cooking a turkey and producing products in your manufacturing plant. Both carry the same risk of either producing too few parts (resulting in a raw turkey) or producing too many parts (resulting in an overcooked, dry turkey). Lucky for us less-than-stellar cooks, some ERP software comes with a built-in pop-up timer. IQMS calls its timer the RealTime Production Monitoring system. From any work center, IQMS can easily capture and track detailed production information, then automatically transmit the data back to your ERP software at sub-second speeds. With that real-time information, you can view total part counts, production time, downtime, rejects and parts remaining as production is occurring for improved decision making, efficiency and productivity. With RealTime Production Monitoring, you always know exactly how many products you have manufactured, which greatly reduces the risk of under or over producing. If that degree of data collection is not robust enough, you can elevate it to the next level and capture individual part parameters with the RealTime Process Monitoring solution. Through low cost programmable logic controllers (PLCs) and sensors, automatically capture and track user-defined parameters (such as pressure, temperature, dimension, weight, fill rate, etc.) for each item, tool and work center configuration, then immediately send those parameters into EnterpriseIQ for analysis. Think of it as the turkey pop-up timer's older brother. Risk management is a serious factor of any competitive manufacturer. By leveraging the tools in your comprehensive ERP solution, you can help to mitigate some common shop floor risks. The IQMS RealTime Production and Process Monitoring systems may be slightly more sophisticated than the traditional turkey pop-up timer, but they both deliver you the same result: A perfect product every time.